Recommended For: Fans of darker fairy tale retellings, and yummy kissy scenes! 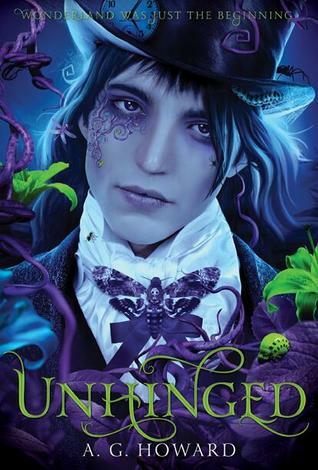 You may remember that I really enjoyed the first novel in this series, and I was very impatient to get my hands on Unhinged. I am sorry to say that though Unhinged was enjoyable, it fell a little short of my expectations. I have a few issues with this novel, the first being the world building, or lack of world building in Unhinged. One of the things that made me fall in love with Splintered was the magic and darkness of Wonderland. I was completely enthralled by the macabre way in which Howard shifted the setting from childhood fantasy to twisted nightmare. This element was nearly missing from Unhinged, with the exception of flashbacks of Alyssa’s childhood in Wonderland. Instead, the novel took place in the human realm which made the shift from world building to follow the relationships of the series more, which brings me to my second problem with Unhinged. I had a very hard time with the relationships in this novel, and frankly, I struggled deeply to relate to Alyssa. I found her to be spiteful, and childish, and not only do I think that she has outgrown Jeb, and is keeping him around for selfish reasons, I completely think that he has outgrown her, and deserves better. Prior to reading Unhinged I was all for Team Morpheus, and I can still see why he should be with Alyssa over Jeb, but in truth, I think that Alyssa has a lot of self discovery and maturing to do before she deserves either man in this love triangle. These negatives aside, the plot was driven, the intrigue was there, and there were many reveled secrets that kept me interested. I enjoyed every scene with Morpheus, he stole the show in this novel and my favorite parts of Unhinged were those that included Chessie, Rabid White, and any Wonderland elements. I will say that the ending of Unhinged was especially interesting, it gave me a glimpse of who Alyssa is becoming, and if this glimpse into her character then I think she is going to grow into someone fantastic. At this point, though I was still interested enough in the story, the ending really reestablished my need to follow the series through to the end. Admittedly, I did find this novel to suffer a bit of a sophomore slump, but it was still an interesting enough read that I look forward to what is to come in Ensnared. 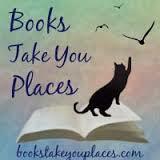 This entry was posted in Reviews and tagged Alice in Wonderland, dark fantasy, fantasy, retellings, romance, young adult. Bookmark the permalink. I agree with you about the Jeb relationship. Things just weren’t working with them this time around. And, oh, Morpheus. Stealing the show once again and the hearts of every girl, as well. I’m maybe a chap-and-a-half away from the end (would’ve finished last night but, bleh, bedtime), and was wondering how I’d articulate my so-so feelings about the book. I think reading your review may have given me a starting place. Thank ye.